Now You Can Gain All the Insider Knowledge of a Pro Screenwriter in a Fraction of the Time, Without Spending a Small Fortune on a Degree. Do You Wish You Could Get More Managers and Execs To Read Your Script? 2. Most aspiring screenwriters gain their knowledge on how to write passively: from reading screenwriting books and blogs and listening to lectures at seminars. This means when it comes to actually sitting down to write a screenplay, they find it hard to apply their new-found knowledge, resulting in the same mistakes being made and an increase in frustration. 3. Most aspiring screenwriters don’t realize you need to learn by doing. And not just aimlessly writing every day, but doing practical, hands-on screenwriting drills within each area of screenwriting, from characters to dialogue to structure, etc. That’s why we decided to put together this online screenwriting course, called Script Hackr. It’s aim is to solve these and many other problems aspiring screenwriters just like you face on a daily basis on their way to becoming professional writers. …and save years figuring out how to write like a pro. 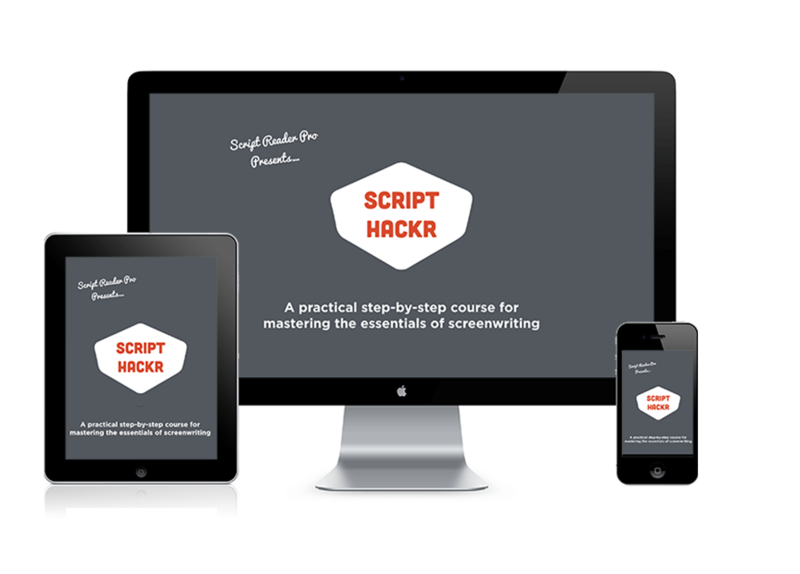 Script Hackr is the only online screenwriting course made up of simplified theory hacks and practical exercises used by professional screenwriters. Each one is designed to cut through the “fluff” found in most screenwriting courses, books and seminars. Put together, the course makes up the essential building blocks of screenwriting you need to master before sending out another screenplay. And they’re all designed and used by professional screenwriters who’ve used them to kickstart their own careers. You can read about us in more detail on our About Us page but, in a nutshell, after much trial and (even more) error, we’ve “made it” as pro screenwriters and now we’re here to help you do the same. That’s why we’ve collectively poured all our professional experience into the Script Hackr, and the result is all the very best writing strategies and hacks that truly work—all in one online screenwriting course. » Master the essentials of screenwriting: character, dialogue, structure and more, step-by-step and as quickly and economically as possible. » Learn by doing rather than just passively listening or reading. » Use hands-on, practical exercises to break down characters, structure, scenes etc. to fully understand how screenplays are put together. 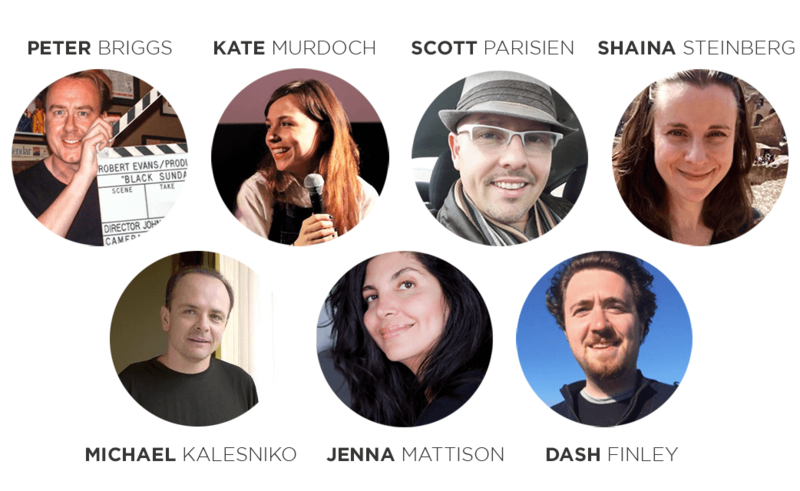 » Save time and money that other writers spend on expensive seminars and degrees. » You’re free to work at your own pace, as the course is always available to you once you’ve downloaded it. » Email us at any time with questions or to receive feedback on your completed practical exercises from our script readers if you wish. What’s Inside Our Screenwriting Course, Script Hackr? » Each module is broken down into three parts: 1. Theory Hacks, 2. Practical Exercises, 3. Key Rookie Mistakes. The Theory Hack is a one-way detour out of screenwriting theoryville in which the module’s subject is demystified once and for all. The Practical Exercise then focuses on doing rather than reading. Finally, the Key Rookie Mistake flags the mistakes that many other aspiring writers make and that you need to avoid. » This screenwriting course will help you nail the building blocks, to find your writing “voice” and to teach you how to write a screenplay that won’t get passed over due to rookie errors. » Each module comes in video, audio and pdf eBook formats so you can learn using whatever method suits you best. There is also a Resources Section where you’ll find toolkits for each module, including worksheets, an Ultimate Course Planner, cheat sheets, movie lists, screenplays, etc. » Everything in this course is designed to drastically improve your screenwriting ability. However, getting the most out of it and becoming successful requires taking action. » You’re not alone. While this is a downloadable course which you can work on at your own pace, you’ll also have access to us at all times. We will answer any questions you have as you go along and check, comment on and provide feedback on your work. It’s time to take a stand. 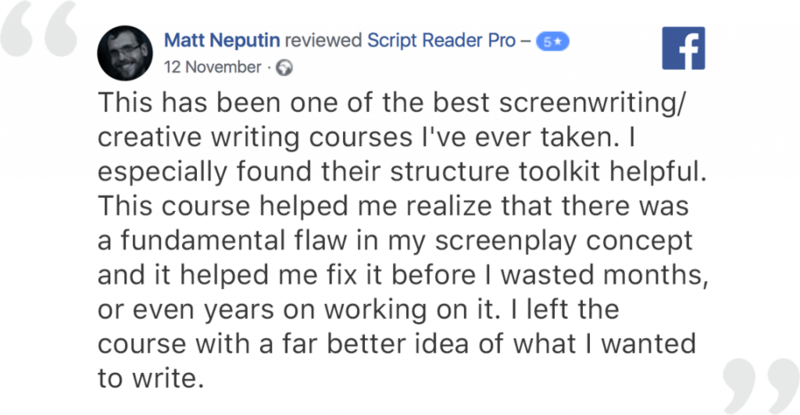 That’s why we want to teach you everything we know about how to master the fundamentals in one, simple, practical, online screenwriting course. Is there anything worse for a writer than realizing three months into a screenplay that there’s a fundamental flaw in the overall concept? Months of work are often wasted unnecessarily. Therefore, in Module 1, we kick off with a great Theory Hack that will show you in three steps all you need to know to create the strongest possible concept and logline before you start writing. Then, in the Practical Exercises section, we show you how to come up with amazing ideas for a screenplay, and then how to refine and develop it into a rock-solid logline. Many aspiring screenwriters make the mistake of letting the theme of the story “reveal itself” over several drafts, but this approach can lead to many problems further down the road. That’s why, in Module 2, we establish a strong theme for your script. In the Theory Hack section, we demystify much of the confusing information out there on theme. Then, as Practical Exercises, we show you how to further deepen your understanding of theme so your screenplay feels like it has something to say, rather than just consisting of a series of insubstantial scenes and events. Creating characters out of thin air that audiences are going to care deeply about or be fascinated by (or both) is perhaps the hardest aspect of screenwriting and not made easier by the sheer volume of vague, confusing or simply plain wrong advice that’s out there. In our Theory Hack, we will demystify this theory and simplify your approach to creating believable, interesting characters. Then we show you how to apply this theory through a great, hands-on, practical exercise. The traditional, broad, three-act structure screenplay model is outdated and misleading. In this module, we explore what’s really going on beneath the generic three-act structure: sequences. In the Theory Hack section, we will show you how to break down three acts into seven sequences which add another two major plot points in Act 2. As a Practical Exercise, we show you how to master this sequence theory to make screenplay structure much easier to navigate. It is so simple, yet effective, that you’ll wish you discovered it years ago. There’s a ton of information out there on dialogue, structure, characters, but hardly anything on scenes. And what there is on how to craft a scene is often confusing and/or misleading. Our Theory Hack will dispel this confusion by showing you how to write a scene by breaking it down into three simple steps. Then we have two Practical Exercises for you, which will show you how to master these theory hacks. Bad dialogue is maybe the quickest way to turn a reader off your script, and yet it is also one of the most elusive crafts to master for an aspiring screenwriter. We think the best way to do this, however, is not by learning tons of theory, but by doing practical, hands-on dialogue exercises. So, there’s no Theory Hack in this module. Instead, we show you three practical exercises aimed at defeating the three most common problems found in dialogue. Great description draws the reader in and immerses them in the story. Bad description alienates them, indicating they’re not in the hands of a writer who knows what they’re doing. An experienced reader can tell from page one whether someone can write, and that’s why it’s super important to master an effective writing style so you fall into the former camp rather than the latter. Just as in the Dialogue Hack module, there’s no Theory Hack in this module. Writing effective description is something that’s best improved through doing rather than theorizing. We’ll show you exactly how, through a simple hands-on exercise, to make your writing style as clean, visual and evocative as possible. 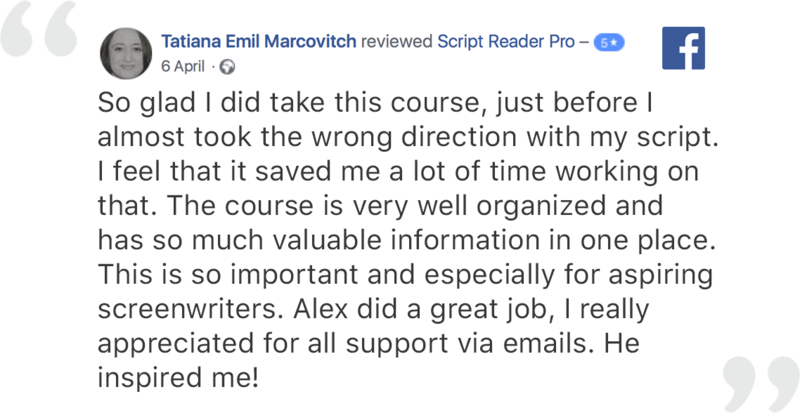 This course contains all the years of our combined experience here at Script Reader Pro and for $299 $99 you can get the whole course downloaded to your computer in a matter of minutes. Click the Add to Cart button below and enter the coupon code COURSE123 at checkout to do just that. This offer won’t be around for much longer. What Are Some of Your Other Options? Of course, you don’t have to purchase our downloadable screenwriting course in order to supercharge your screenwriting. So let’s take a look at some alternatives. » Method #1: Read more screenwriting books and attend more seminars. There are a ton of screenwriting books and seminars out there but often get stuck in theoryville. If you’ve ever cracked open Robert McKee’s Story, you’ll know what we mean. » Method #2: Keep writing. The advice to just “write, write, write every day” is well known, but often leads to repetition of the same mistakes and aimless writing without direction. » Method #3: Enroll on an offline screenwriting course. If you have the cash (and time) to invest in a screenwriting course offline, such as a BFA or MFA this could be a good option. But bear in mind course fees run in the tens of thousands. Even a short offline screenwriting course will usually set you back over $500. We created this online screenwriting course because we believe that screenwriting shouldn’t be as mysterious and hard as it appears. 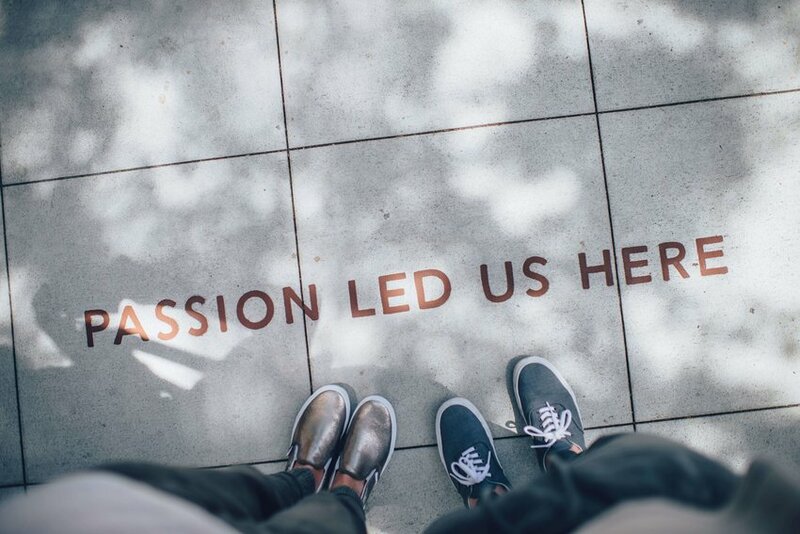 This is your passion and your future and so it’s important to learn from writers who’ve gone before you, use their expertize and follow in their footsteps in order to get where you want to be. Simply put, we believe in what we created with Script Hackr. We know the material in this screenwriting course works because we’ve used it to skyrocket our own screenwriting careers and go from aspiring to pro writers. BUT… if you complete the course and find for any reason it doesn’t improve your screenwriting, we’ll give you 100% of your money back. 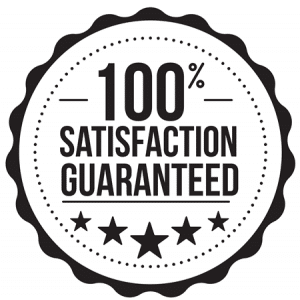 You deserve to try this stuff without taking the risk, so just email us and we’ll make sure you get a FULL REFUND. No questions asked. You’ll probably find the answer to any question you may have about our Script Hackr screenwriting course below, but if not you can find more answers in our knowledge base. Q1. When does the Script Hackr course start and finish? There’s no start date. Once you’ve purchased the online screenwriting course, you’ll be able to download it to your computer and work at your own pace. Q2. Can I take the course if I don’t live in LA? Yes. You can take the course from wherever you are in the world. All you need is an internet connection. Q3. Will I get any support along the way? Yes, you can email us with any queries you have as you work through the course. Q4. Will this screenwriting course help me if I live outside the US and want to break into my home country’s film industry? Yes, the Mentorship Program will help you. Our clients have found success from all corners of the world. While there are differences between, say, the European film industry and Hollywood, the techniques you’ll learn about how to write a screenplay that’s capable of winning contests, gaining attention, getting sold, etc. are universal. You’ll be learning from writers who’ve already broken in and can tell you how to apply the same strategies yourself, even if there may be some differences across various film industries. What matters most is writing a great screenplay. Getting the right people to read it is the easy part. Q5. I haven’t written a script yet. Can I still benefit from the screenwriting course? Script Hackr is designed to be the fastest way to build a solid foundation to your screenwriting craft, no matter what stage in the process you’re at. If you’re just starting out there’s a good chance you’re in the “where the hell do I start” phase. Don’t worry, we know exactly how this feels as most screenwriting advice out there tends to be overly complicated, theoretical, and focused on passively thinking about writing rather than actively doing exercises that improve a writer’s craft. So we know how incredibly frustrating it can be and that’s why we created this screenwriting course, so that both experienced and newbie screenwriters can gain the help they need to succeed. Q6. I’m already a screenwriter with years of experience. Is this screenwriting course right for me? Script Hackr is especially useful for those screenwriters who are just starting out, or have been writing for a while but haven’t made the progress they’d have liked. That said, even if you’ve been writing for years, the screenwriting course can help you stay motivated and open up fresh perspectives you’ve maybe not thought about. Our team know all the proven strategies, hands-on tactics and little-known screenwriting hacks that usually take years to develop, and they’re ready to pass them on to you, no matter what your background or experience. Q7. Will I need any special equipment to complete the online screenwriting course? Nothing other than a computer, internet access, email account and a notepad. Q8. Can I pay in installments? Unfortunately, we don’t offer installments for the course. Download the screenwriting course directly to your computer and access the combined knowledge of our readers here at Script Reader Pro. Don’t forget to enter the coupon code COURSE123 at checkout to get $200 off the price for a limited time only. If you have a query not answered above, we have a dedicated knowledge base where you’ll find the answers to even more questions.